Single believers sometimes have a difficult task when it comes to being a part of ministry and fellowship in the church. So many ministries are geared toward married couples and families that singles often feel lost in the shuffle. Many single believers struggle with loneliness and feelings of inadequacy because they do not have a significant other. A retreat for single ladies can be a great way to reaffirm their importance to God and to the life of the church. Singleness has the potential to carry a lot of loneliness. However, God promises to always be with us. God never breaks His promises! Use this scripture to encourage single ladies who may feel lonely that God is with them. He loves them and will carry them through the difficulties. 34 … An unmarried woman or a virgin is concerned about the things of the Lord, so that she may be holy both in body and in spirit. But a married woman is concerned about the things of the world—how she may please her husband. 35 Now I am saying this for your own benefit, not to put a restraint on you, but because of what is proper and so that you may be devoted to the Lord without distraction. Single believers are in a unique position for serving God. Without the responsibilities of a household to keep (family to feed, children to tend, husband to clean up after, etc) a single woman is free to explore many avenues of spiritual service. She can travel for mission journeys, devote evenings to Bible studies and spend more time seeking out opportunities to serve God and minister to others. and the Holy One of Israel is your Redeemer; He is called the God of all the earth. There is a mistaken belief that has infiltrated our culture and has been perpetuated by movies and television shows and that is this: You are incomplete without a boyfriend/fiancé/husband. The notion that it’s up to a significant other to “complete us” is now hard-wired into our hearts and minds. God has a much clearer and better view: He will be enough for us when we put all our hope and trust in Him. Sure, it’s not good for man/women to be alone. However, as we’ve already stated, we’re never alone when we’re trusting in God. This craft is simple, but very meaningful and effective. Provide medium size canvasses and a means of creating the “Keep Calm” phrase. This can be done using stick-on letters, stencils, or even free-hand. Allow your attendees to customize the canvases using their favorite colors of paint, glitter, stickers, etc. Be sure to include the scripture heading of Isaiah 41:10 to serve as a reminder that while they may be single, they are never alone. This craft is fun, unique and very useful! Supply a variety of inexpensive potholders and allow the ladies to construct clutches. Fill them with small but important emergency items like a screwdriver, LED flashlight, tire gauge, etc. This can be kept in a car or carried in a purse for use in unforeseen circumstances. Another useful craft, this can be used as a notebook, a gratitude journal, or just a book to jot down thoughts and ideas. Provide a selection of colored paper, oil cloth, faux leather or other material for the cover of the journals. Follow the simple instructions in this link for putting the journal together, then allow your attendees to personalize their journals using stickers, stamps or other embellishments. Start your retreat with a fun game that encourages interaction. This game requires activity since the object is to stomp the other attendees’ balloons while trying to protect your own. Inside the balloons are scripture promises. Once a balloon has been popped, its owner must pick up the scripture promise inside and have a seat. The lady with the last un-popped balloon wins. No extra supplies are needed for this game, just a bit of imagination. Begin by explaining that you and the group will tell a familiar fairy tale or other story. The catch is that the story will be told one word at a time, with each lady in the group contributing a word. The story will inevitably take a silly turn as funny words and surprising elements are thrown into the story. When your story is finished, remind the ladies that the stories of our lives are told one word, one day at a time. We don’t always know which way our stories will go, but God does. This game is lots of fun and requires everyone to pay attention and remember what’s been shared by others. Have your group seated in a circle and begin by saying, “I’m going on a mission trip, and I’m bringing________ “(something that begins with the letter A). The next person in the circle says “I’m going on a mission trip and I’m bringing”: the A item and then she must add something beginning with the letter B. The game goes around the circle with each lady adding something beginning with the next letter of the alphabet. However, she MUST repeat all the items that preceded in order. The game gets very tricky by the end, but can be hilarious. Bring in a number of professionals (preferably ladies) and have them demonstrate how to do certain tasks that single women may not know how to do. For example, demonstrate how to check the oil in an automobile or fix a flat tire. You might even throw in a demo of self-defense moves and skills. Everyone loves a sweet take-home. Choose an item from the linked list or combine several to make up a goody bag. Send your attendees home with some awesome swag that will help them remember how much fun they had and encourage them to sign-up for more amazing retreats. It can be difficult being single. Even in the church, it can be hard for a single woman to find a place to fit in and a meaningful way to take part in ministry. 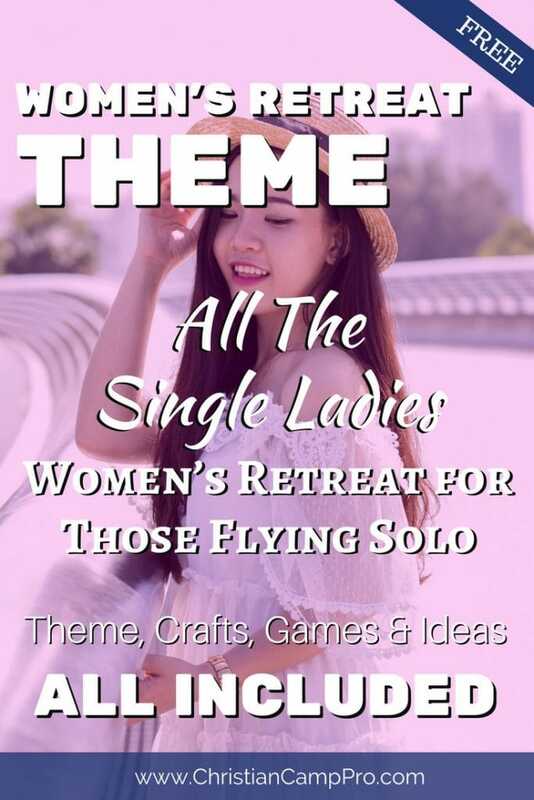 Having a single ladies’ retreat can be a fun and loving way to reach out to unmarried women and offer them encouragement and a place to belong. This article was made possible by the folks at Refreshing Mountain.